Yale was founded by colonial clergy, such as Abraham Pierson and Timothy Woodbridge. Abraham Pierson was appointed by Yale's original trustees as the first rector (or president) of Yale college, from 1701-1707. He served concurrently as the minister of the Killingworth (now Clinton) Congregational church, where Yale college was based during his tenure. 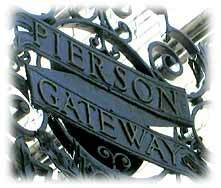 It is uncertain whether Abraham Pierson owned any slaves. Pierson's successor at the Killingworth church, Rev. Jared Eliot, owned slaves and created Yale's first library endowment.